Posted March 1st, 2016 by Sue & filed under Uncategorized. Will this be the year you try something new or take up a regular physical activity you enjoy? We have plenty of options for you to choose from! The latest additions to our class list (that has now topped 60 classes across Oxfordshire) can be found below. I would like to draw particular attention to ALL Big Bold and Balance classes (for people with Parkinson’s) that are now free to attend – thanks to Parkinson’s UK. With Hadden Hill Golf club, Didcot we will be running joint Golf lessons. >There are two types of session: Ladies Golf and Golf suitable for people with dementia. >Each of the 5 session lasts 40 mins. and the cost per session is £6 (includes a hot drink). >For any questions please feel free to contact us, or Tom at the Golf Clubtomhartleygolf@hotmail.com. (to book please contact Tom). The homepage of our website has now been enhanced with a blue “Health Info” button. Clicking on it will take you to short information section on particular chronic conditions such as Diabetes and Cancer. Once logged in, you will be able to access all of our classes and others in Oxfordshire. If you log your regular activity (recording exercise has been proven to motivate us to continue) you will receive rewards once you reach certain levels. We have some beautiful pedometers, canvas shopping bags and towels in our office to be claimed! Finally, if you have any comments or feedback on the website we are keen to hear from you. And last but not least, we wanted to give you a voucher to use and share with friends. 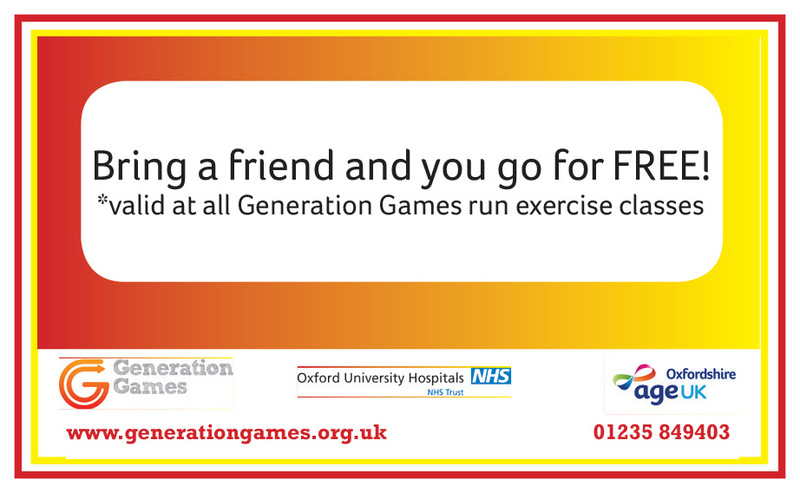 If you bring a friend along who has never been to a Generation Games class you go for free! (and they naturally go for free as it is their first session. We hope you enjoy a new class! Copyright © 2016 Generation Games / Age UK Oxfordshire, All rights reserved. This is our first electronic newsletter. We will be sending them quarterly throughout the year. Please click ‘unsubscribe’ if you don not wish to receive further newsletters.